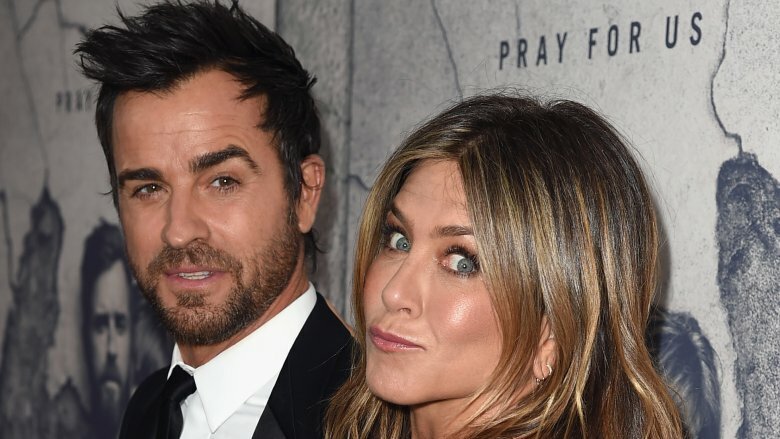 In news that shocked the world and left pretty much all of us believing that love is dead, Jennifer Aniston and Justin Theroux are over. The estranged couple said in a joint statement to the The Associated Press on Feb. 15, 2018, "Normally we would do this privately, but given that the gossip industry cannot resist an opportunity to speculate and invent, we wanted to convey the truth directly. Whatever else is printed about us that is not directly from us, is someone else's fictional narrative. Above all, we are determined to maintain the deep respect and love that we have for one another." They were a couple since 2011, but were only married two years before pulling the plug on the relationship. What the heck happened to this seemingly happy husband and wife? A source told E! News that despite their mutual penchant for wearing black, Aniston and Theroux are simply from different worlds. "Jennifer and Justin fell in love hard and fast and yet they were never really suited to one another. He was a New York hipster that loved the alternative lifestyle and Jennifer was living a much more reclusive life when they first started to fall in love. The initial chemistry between them made it easy for them to ignore their differences and incompatibility … He's more nomadic, more of a free spirit, he's rugged and urban and Jennifer just isn't that kind of person." The source added, "Jennifer's previous breakups had taught her to live a life that was very secular; her friendship group was small and consisted of people that she intimately trusted. Justin was used to being way more social and so that was a big concession for him … They've had problems for a while." A source told People, "For years, even before they married, they compromised and did their own thing. It has involved long separations, especially for their work demands." The last year was particularly grueling schedule-wise: After Theroux wrapped up work on The Leftovers, he did voiceover work for The Lego Ninjago Movie (2017), appeared in Star Wars: The Last Jedi (2017), filmed three more movies, and signed on for the TV show Maniac. Meanwhile, Aniston starred in The Yellow Birds (2017), filmed Dumplin' (2018), and signed on to an as-yet-untitled Apple TV project alongside Reese Witherspoon for 2018. A source told Radar Online, "Jen's proud of Justin's work but she'd be lying if she said she wasn't looking forward to the end of his HBO series, The Leftovers, which has relocated to Australia for its third season." The insider claimed that "after Justin told her bosses were leaving a door open should HBO want another series, Jen flipped out … It would have been better if he could have gotten a serious movie career off the ground as that only involves him being away for six weeks instead of six months." Aniston often gets painted as the victim of man-stealing Angelina Jolie, but it turns out she may have been a homewrecker herself. Before shacking up with Aniston in 2011, Theroux was in a live-in relationship with stylist Heidi Bivens for 14 years. Bivens' mother told Radar Online, "Heidi told me what Justin had told her [after they broke up], that something was going to be written about him and Jennifer, that something was going on between them and he wanted her to know that it was nothing, there was nothing to it. Out of his own mouth he told my daughter there was nothing to [the news he was involved with Jennifer]." 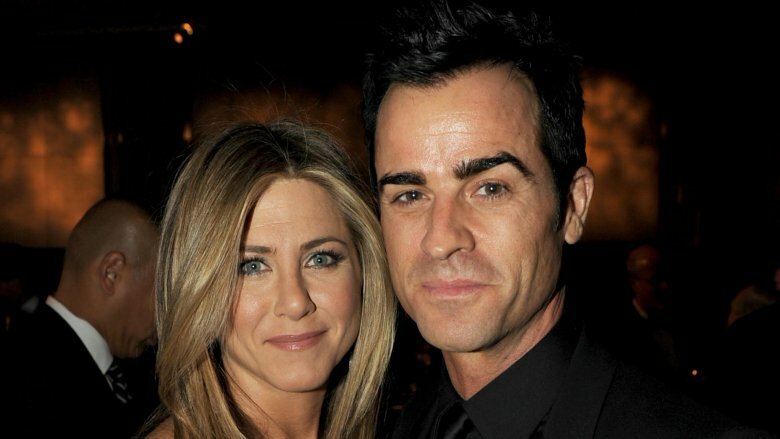 A source told Grazia magazine (via Page Six), that Aniston tried to mend fences with Bivens. "Jen told Heidi that she understands what a painful time she has been going through and explained that she wanted her to know, hand on heart, that she would never steal another woman's man," the insider said." 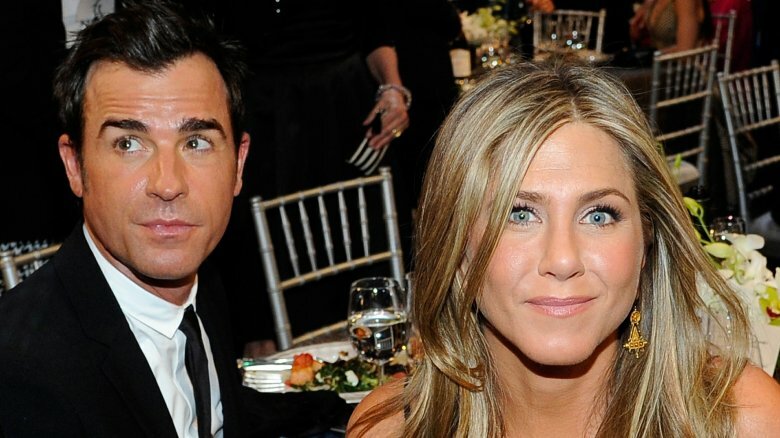 The biggest hurdle for Aniston and Theroux's marriage was the physical distance between them. A source told People, "Jennifer loves her life in Los Angeles, and if anything, she has grown more attached to being there. Justin is not that comfortable or happy in Los Angeles all the time. He loves New York and always has." An insider told Us Weekly, "Jen tried the whole living in New York City thing with Justin, but at heart, she is a California girl. New York City just wasn't ever going to be home for Jen … [Theroux] spent most of his time [with friends in New York]. Encouraging Justin to spend as much time as he wanted in New York City is what doomed the marriage. Jen thought by doing so, spending time without her would make Justin miss her more." A supposed friend of the pair saw the split coming, telling In Touch, "Jen and Justin have arguments about where they should live. Jen can't stand the weather in New York and she hates not having a car in the city to drive to wherever she needs to go … She's always hoping that they can work out their differences — she sees a glimmer of hope every time Justin returns to LA … Unless there is a miraculous turnaround on both of their parts and they can actually live together in the same home in the same city, Jen and Justin could be history." Aniston's womb has been a constant source of media scrutiny since her days as Mrs. Brad Pitt, and her marriage to Theroux brought out tabloid hawks even more — and that devastated her, likely adding to tension within the marriage. In a blistering op-ed for The Huffington Post in July 2016, Aniston wrote, "For the record, I am not pregnant. What I am is fed up … I may become a mother someday … But I'm not in pursuit of motherhood because I feel incomplete in some way … I resent being made to feel 'less than' because my body is changing and/or I had a burger for lunch and was photographed from a weird angle and therefore deemed one of two things: 'pregnant' or 'fat.' Not to mention the painful awkwardness that comes with being congratulated by friends, coworkers and strangers alike on one's fictional pregnancy (often a dozen times in a single day)." Unfortunately, her op-ed didn't necessarily help. As Aniston told Vogue in August 2017, "I think the problem is the tabloids and the gossip columns taking the human body and putting it in a category. They're either fat-shaming, or body-shaming, or childless-shaming … I have worked too hard in this life and this career to be whittled down to a sad, childless human … I couldn't hear this narrative anymore about being pregnant or not pregnant; you have no idea what is going on personally in our lives and why that is or is not happening." Aniston dated 300 (2006) actor Gerard Butler in 2009 while they were filming The Bounty Hunter (2010). Though the romance was short-lived, sources say the former co-stars may be giving it another go. "Jen has been leaning hard on Gerard as her relationship with Justin continues to disintegrate," a source told Radar Online in February 2018, just days before news of the breakup broke. The source added that Butler telling Watch What Happens Live with Andy Cohen in January 2018 that Aniston was a better kisser than Angelina Jolie was no accident, either. "It's no coincidence that just as Jen's marriage is imploding, Gerard made a public display of affection and loyalty toward her … She's really touched that Gerard is proving he has her back," the insider alleged. "Gerard told Jen he's still carrying a torch for her. He's made it clear that the timing wasn't right before, but he's ready to commit to her now." Did her eating habits annoy him? 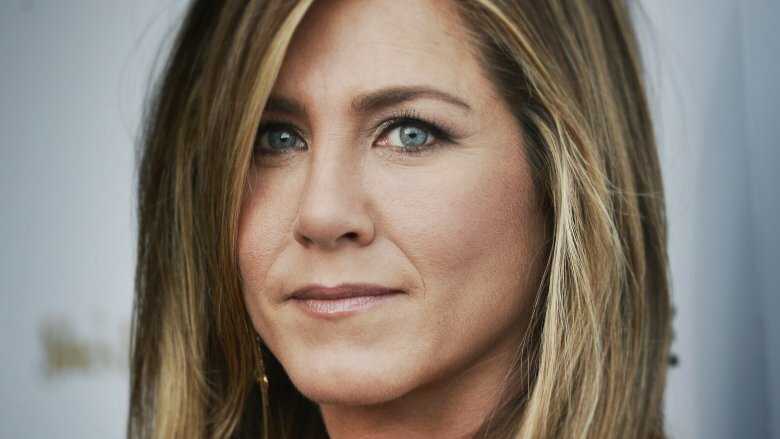 The ageless, ever-toned Aniston is one of Hollywood's most beautiful women and has been since she hit the big time with Friends — and she puts a lot of work into staying that way. Did her strict diet bother Theroux? A source told Radar Online in early February 2018, "Jen is banning all kinds of food from the house, and even though she's barely spending any time in New York these days, she won't let Justin have them at the apartment either. Right now, she won't touch anything with soy or dairy in it and freaks out if she so much as sees them in the fridge." The source added that Aniston's behavior went beyond just watching her own girlish figure, alleging, "It's just Jen's latest way of controlling him. But this kind of behavior is not exactly going to help them get their relationship back on track." Apparently the last straw for Aniston and Theroux was one particular fight that started out minor but blew up into something major. A source told Radar Online that "the fight to end all fights" shouldn't even have been a big deal. "It was a stupid argument — the kind of disagreement most couples have," the insider said. "But this time, things spiraled out of control, and Jen flipped out. She came at Justin really hard. It was a tongue-lashing of epic proportions. It was best for both of them that Justin removed himself from the situation before it got physical." The source added, "Justin's told people that Jen went too far, and he's not going back." Still no word on what the heck they were fighting about in the first place, but chances are it wasn't over whether to have chicken or fish for dinner. No one says you have to love all of your spouse's friends, but in light of the #MeToo and Time's Up movements, Aniston was allegedly even more frustrated with Theroux's bro brood than ever — in part because of the old adage, "You are the company you keep." "These are all guys Justin seriously respected, but Jen's demanding he have no association with them going forward," the source said. "Justin likes to play up his edgy 'street cred' and his cool New York friends, but this is way more controversial than Jen would like, especially when she's dealing with her big corporate sponsors like Smart Water or production partners like Apple." Was she jealous of his female friends? 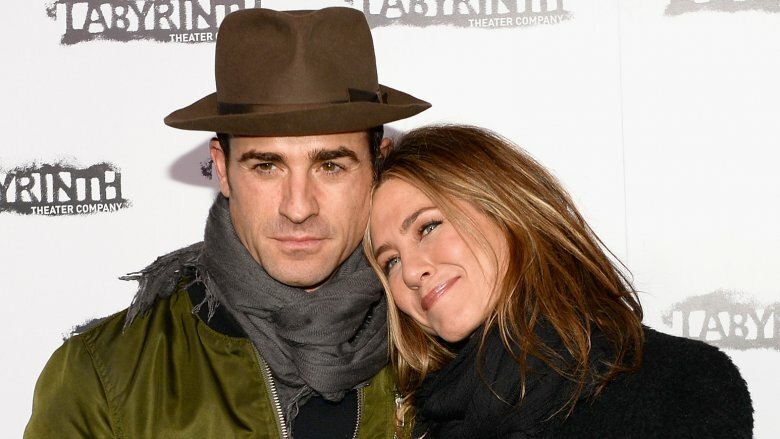 Insiders claim Aniston was often jealous of Theroux's interactions with other women, especially on set — which, given the history of Brangelina, is pretty understandable for her. A source told Radar Online that Theroux had gotten "close" to co-star Emma Stone while filming Maniac. "Justin can be pretty flirtatious when Jen's not around … Right now there's more friction than trust between Justin and Jen." 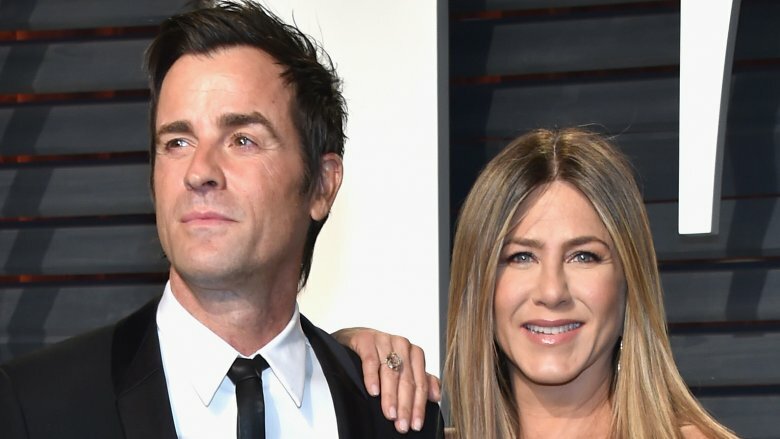 "Every time he does actually get time off and manages to come to the same city, he hangs out with everybody but [Aniston]," a source told In Touch. "Jen has grown incredibly jealous … [His friendships with women] have been one of the couple's chief problems." 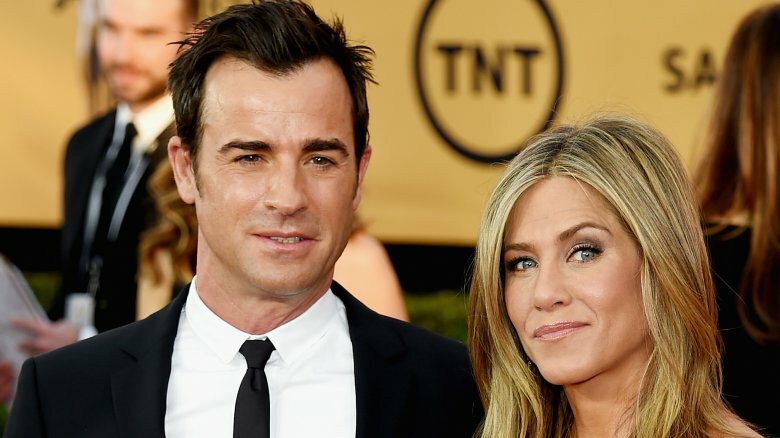 The media attention that surrounds all things Aniston may have hurt the marriage. "He absolutely hated it at first," a source told E! News. "He fell in love with Jennifer so it was something he came to accept … Everyone around him knew it wasn't really who he was." Another insider told Radar Online that when Brangelina filed for divorce, Theroux resented the paparazzi presence. "The moment this divorce news was announced it was all about calculating [Aniston's] next public appearance and timing it in a way that would embarrass Brad and Angie," the source alleged. "Justin hates this, being dragged around like a pawn in her PR game … It's a huge source of tension." A source also accused Theroux of leaving Aniston to fend for herself at the Golden Globes in January 2018. "Jen was absolutely lost without [Theroux]," an insider told In Touch. "He knew Angie would be there, and he picked the worst time to not support his wife … It would be the worst kind of public humiliation because she and Justin have put on such a united front about being one of the happiest couples in Hollywood." 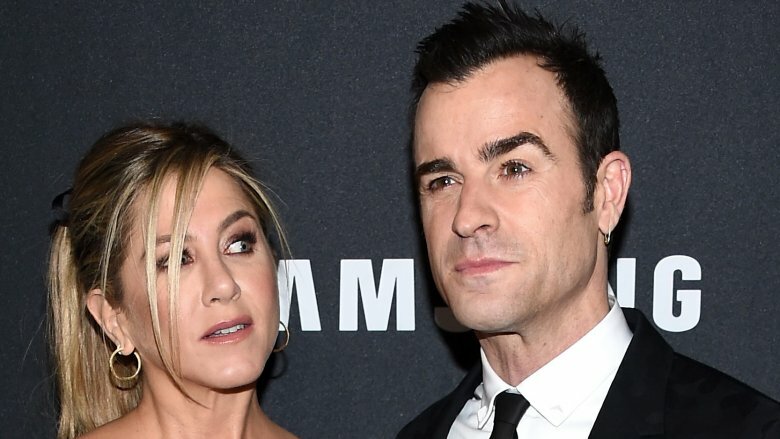 Aniston and her infamous ex are both on the market again, and the rumor mill is already rife with reconciliation rumors. In December 2017, a source told In Touch that Pitt reached out to Aniston in the wake of his own split. "Brad's conversations with Jen have helped him negotiate his new life as he's getting divorced. He feels a deep connection with her … Brad would take a second chance at love with Jen in a heartbeat," the insider claimed. After news of Aniston's split broke, an insider told the outlet, "Jen made a tearful, late-night call to Brad one night recently and explained how Justin went off to the East Coast three months ago, and she felt he was never coming back. She confided in him about all the missteps and problems in the relationship, and Brad provided the calming words that she needed to hear." However, don't get your hopes up too high. 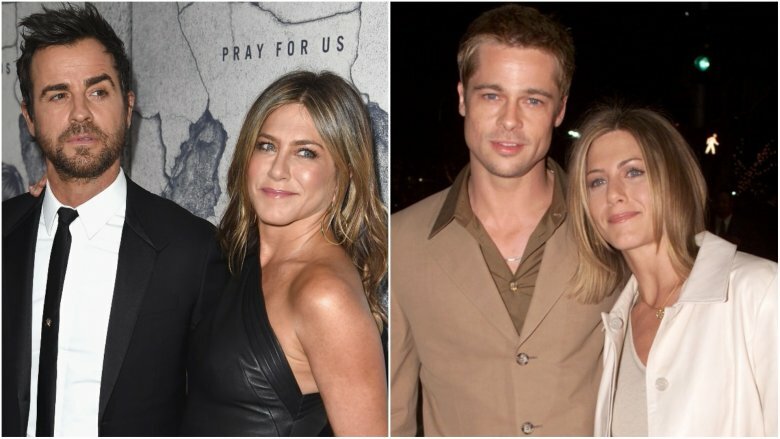 A source told People that Aniston and Pitt "haven't seen each other in ages. For well over a decade now they have lived totally separate lives, and not so surprisingly, they have become totally different people than who they once were when they were together … They broke up, and they did it because they had serious issues. They're not stupid. They remember why it didn't work." The source added, "They've been over each other for longer than they were ever together. It is such ancient history." 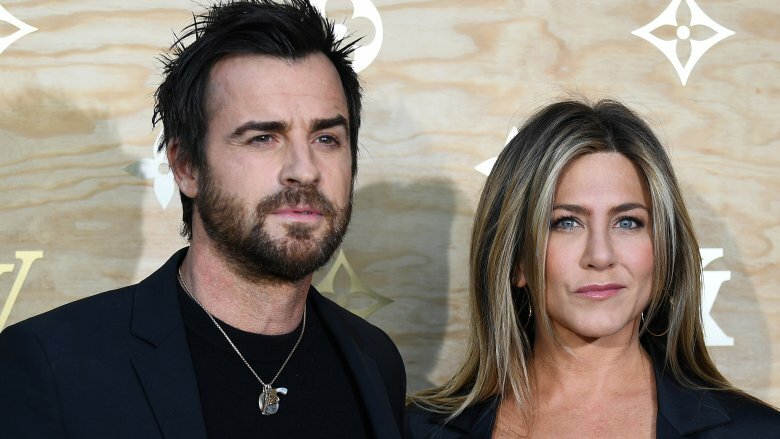 Whether or not she had actually reconnected with ex-husband Brad Pitt, Jennifer Aniston's former relationship with the World War Z movie star may have added cracks in the foundation of her marriage to Justin Theroux. Us Weekly reported that the Friends actress had kept mementoes from her romance with Pitt. And, according to the magazine's insiders, the keepsakes rubbed Theroux the wrong way and made him feel insecure because, well, Brad Pitt is … Brad Pitt. "He stumbled upon old Post-it notes Brad had written," a source told Us Weekly. "Sweet little Post-its like, 'You looked nice tonight' or 'Miss you already.' Jen assured him they weren't a big deal, but Justin wasn't thrilled … Justin had moments of insecurity like that." Honestly, we wouldn't blame Theroux for being bothered by the love notes. With her marriage to Pitt in the past, couldn't Aniston have just thrown them away if they made her hubby feel uncomfortable? Did she use him to change her image? Post-Pitt, Aniston has struggled to shed the tabloid image that her personal life is some sort of heartbreaking wasteland of loneliness. Some have suggested her marriage to Theroux was motivated by a deep-rooted desire to shed that perception. "Constant scrutiny of Jen's personal life, including whether she would ever find her happily ever after, played a huge role in her marriage to Justin," a source told Us Weekly. "It was obvious Jen needed more than an engagement or to be life partners with Justin. He didn't want to lose her, so they got married." An insider claimed, "Jen has struggled with the perception that she is this pathetic woman after the divorce from Brad. It played a role in her wanting to marry Justin." Insiders claim that Theroux's partying with "edgy" New Yorkers was a minus for Aniston — and that Theroux got close with photographer Petra Collins while Aniston was home in Los Angeles. "The reality is he's been partying with all sorts of people in New York and couldn't have looked less like a married man," a source told The Sun. "He's been pretty much living in New York full time and growing close to other people, so it was only a matter of time … The arty scene really embraced him. He's a quirky character with very diverse interests. He loves fashion, design and, weirdly, has a collection of human teeth. The reality is Jen just doesn't fit in. She's a home girl who likes cozy nights in with friends. He wants to feel cutting-edge and different." 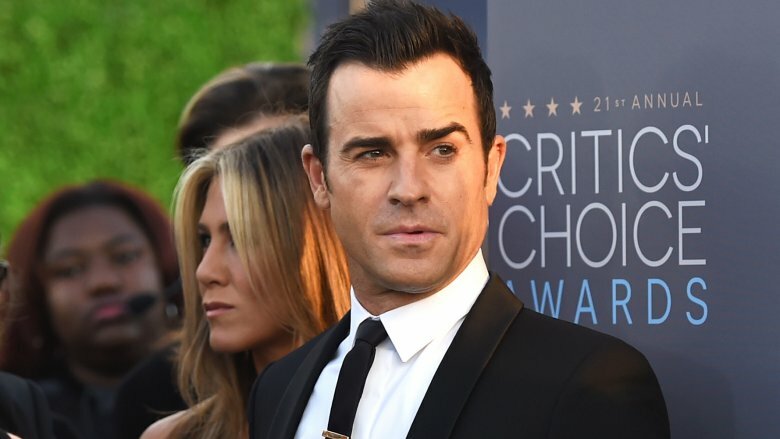 Aniston and Theroux allegedly tried couples counseling to get their marriage back on track, but it was all for naught. "Jen and Justin had been in marriage counseling. In fact, they had been in couples counseling long before they married. They tried to work through issues relating to their very different lifestyles, communication and, of course, the New York City vs. Los Angeles living arrangement," a source told Us Weekly. 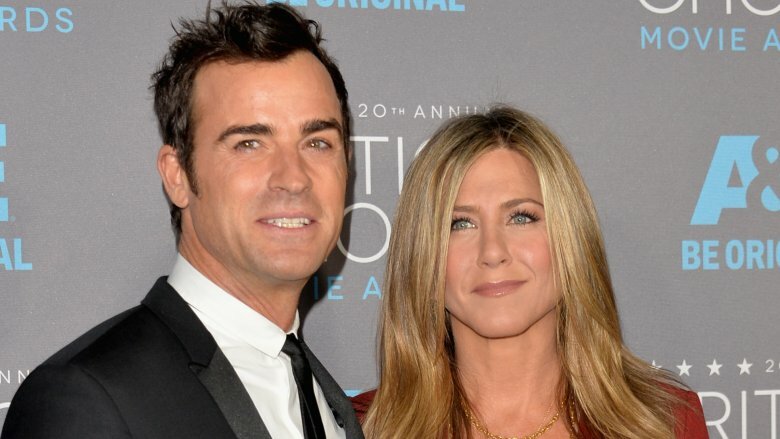 "The counseling has been a huge factor in how Jen is dealing with the breakup. She feels that she truly gave it her best effort. There isn't anger, but rather a deep sadness from Jen that the marriage is ending. It just came down to the realization that the issues were never going to change. Jen is at peace with it." Aniston and Theroux went on a vacation to Mexico together with actor Jason Bateman and his wife, actress Amanda Anka, in December 2017 and early January 2018 in an alleged effort to mend their relationship. A source told Us Weekly that Anka "has been the mediator in recent months, trying to get Jen and Justin to work through their problems and save their marriage. The Cabo trip was a make or break vacation for Jen and Justin. They went away with their friends hoping to have fun and work on it. The guys and girls hung out separately in Mexico. It didn't work." Are you sitting down for this breakup bombshell? 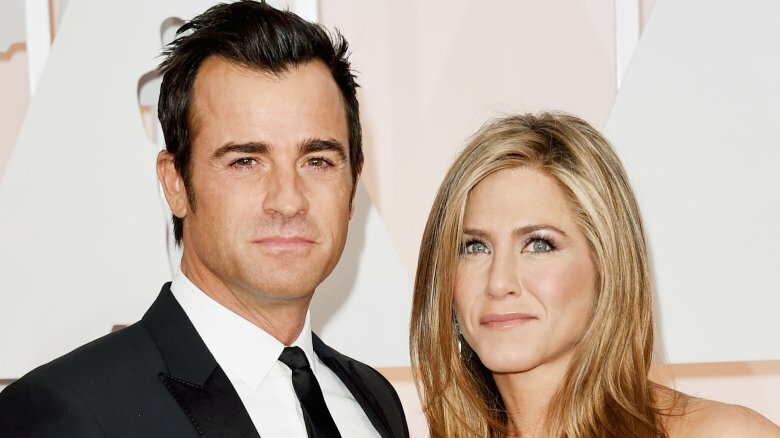 In February 2018, TMZ reported that Theroux and Aniston may have never been legally married at all. Apparently, no marriage records in Los Angeles County exist for the couple, and there have reportedly been whispers for years that they never officially tied the knot. 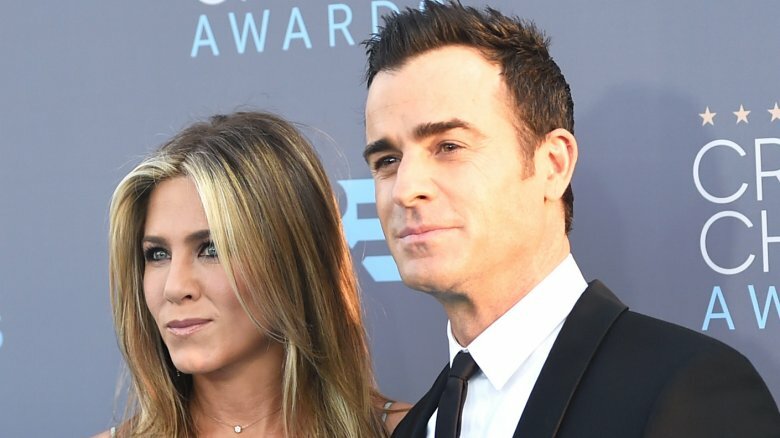 While the gossip rag notes that confidential marriage licenses do exist, TMZ claims that Theroux and Aniston did not obtain one — at least not in the L.A. area. Word that the pair had never legally become husband and wife is further supported by Theroux's reported attitude toward marriage. Sources told Us Weekly that marriage was "just a piece of paper" to Theroux. And, while magazine's insider believed that Theroux must have given in to Aniston's alleged demands for a wedding, it's possible that Theroux may have instead persuaded Aniston to dismiss the idea of a legally binding union. That could explain why, at the time of this writing, there has been no news about either party reaching out to divorce attorneys.